The building echoes the shape of the seaward dune, rising in the middle to give views over the top of the dune to the sea. It comprises a central pavilion with two protective wings. The bedroom wings are orientated to the view shafts each side of the dune, and provide protective arms to the central outdoor space. They act as walls to the future neighbours each side and the public path that runs down the northern boundary. They are composed of small enclosed intimate spaces, providing a retreat from the outdoors, and are only loosely connected to the living area. They are conceived as covered jetties. The central pavilion links the family and guest wings together. It is light and open, to provide a space that is conceived as a raised covered viewing deck, able to be opened up or closed down as necessary. The ground level garage, of concrete and masonry, anchors the building to the site, and conceals the view to new arrivals. Progressing past the garage you reach the entry deck, which extends through the building out to the dunes. 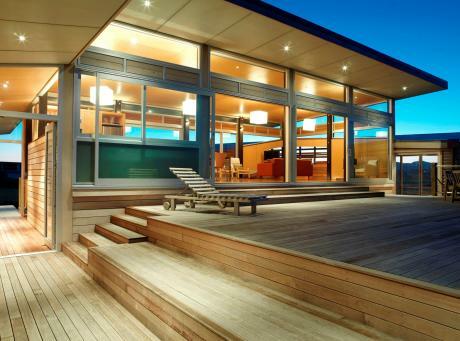 Decks on both sides of the living pavilion provide sheltered outdoor spaces depending on the wind direction.